Fancy a change from your average trip to the movies? 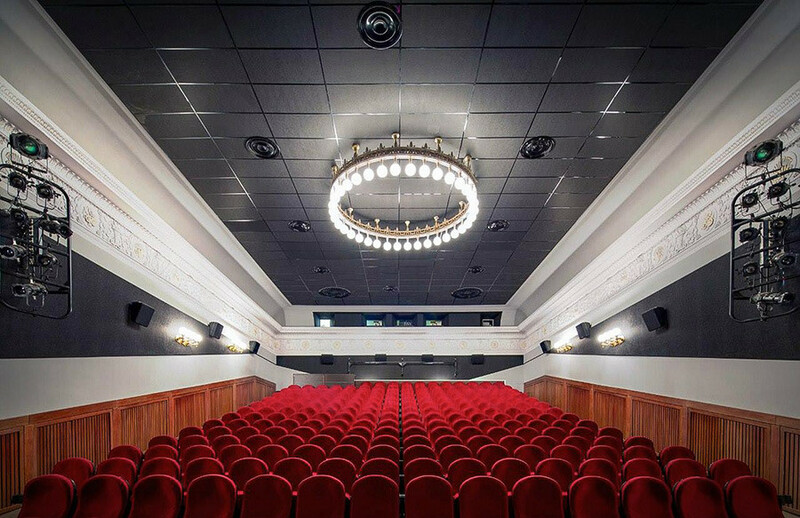 Russia is way ahead of you – these unique movie theaters in Moscow and St. Petersburg show how the country is redefining the way we watch film. 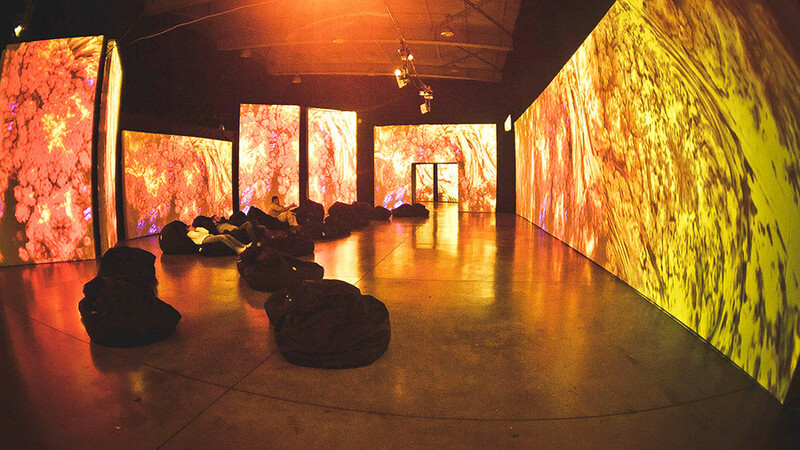 Located in the superbly stylish Flacon Design Factory in Moscow’s north, Lumière Hall prides itself in bringing cinema visuals to new levels of creativity. 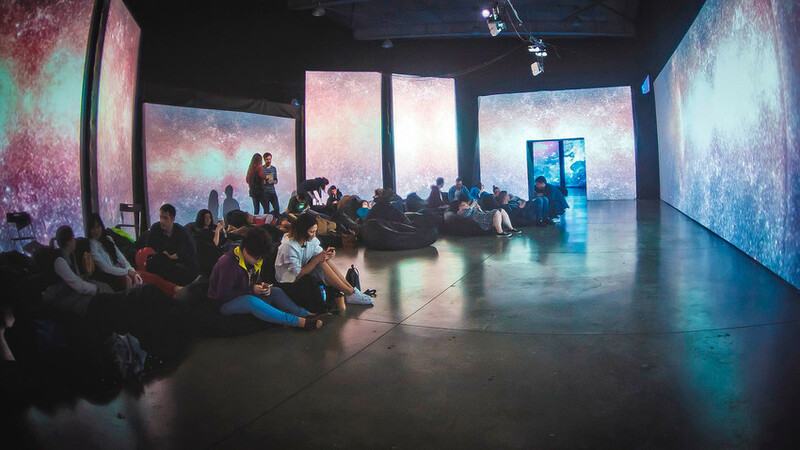 The films shown here are projected in unison onto a distorted, 360° panoramic, 20-screen prism at 6 million pixels, giving beanbag-slouched viewers a chance to witness the artwork at never-before-seen levels of clarity and immersion. Lumière Hall is not the place to go for new releases, but it does a great line in all-night themed movie marathons on Fridays and Saturdays – Woody Allen, Leonardo DiCaprio, and Vincent Cassel, for example, have all been the subjects of midnight cinema sessions here, usually shown in their original language (with Russian subtitles). Selections of films from a particular country are also shown here often. For a minimum ticket price of 550 rubles ($8.90), you’ll get to see three films in one (if you can make it till morning). A step into the prestigious institution that is Illuzion, found in the Kotelnicheskaya Embankment Building (the historic Stalin-era skyscraper which dominates Moscow’s skyline), is like entering a time machine. First cutting its ribbon in 1966, the cinema has kept its historic charm over the years, showcasing a marble foyer with impressive chandeliers and vintage theater interiors. It also serves traditional Soviet snacks for its clientele – you won’t find any popcorn here. The antique vibe of Illuzion also extends to its films, with timeless 20th century classics from all countries regularly on show in their native languages (with Russian subtitles). Although you’ll get the occasional new arthouse film here, its roster is mostly dedicated to golden oldiea – needless to say, this is not the place to come for superhero movies. Tickets can be bought online for just 250 rubles ($4) too, so it’s quite a steal. 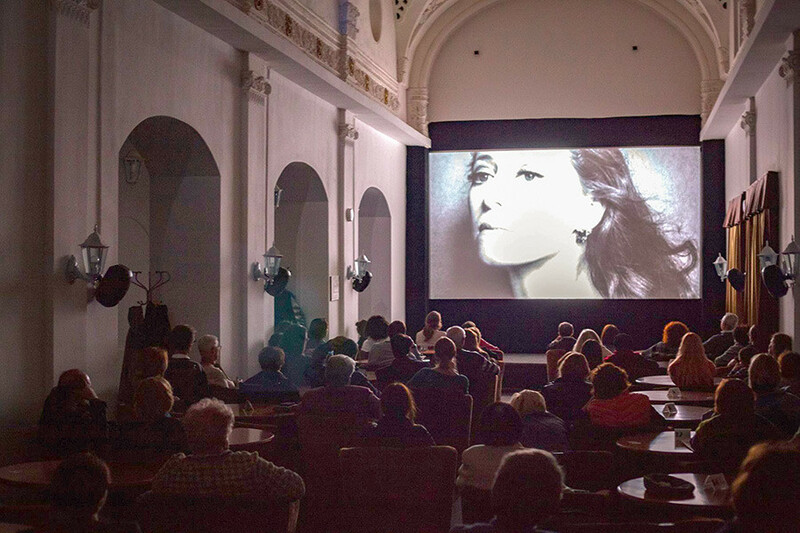 There is an entire rooftop-roaming culture in the “Venice of the North,” so it makes sense that St. Petersburg is now home to a series of cinema screenings from up high. Since 2011, the Roof Cinema project has been organizing spectacles every summer (in English and Russian) from 8 different observation decks across the city, offering film-goers a choice between watching the film or the St. Petersburg skyline. The house party feel at Roof Cinema is made complete by the pizza, deck chairs, and cozy blankets available to viewers. 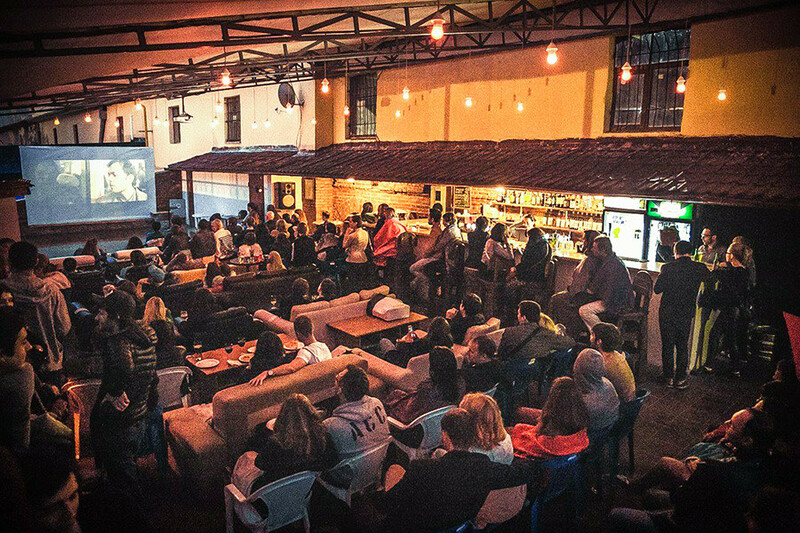 In terms of repertoire, Roof Cinema offers an eclectic mix of everything from noughties films to Soviet and Western classics. The only downside is the price which, at 1000 rubles ($16) per ticket makes it one of the more expensive picture shows in the city. This quirky establishment is more like a set of well-decked out living rooms than movie theaters. That said, the quality of these rooms is nothing short of luxury. We’re talking cozy, cushioned treehouse-like interiors, Roman-style dining tables, Midsummer Night’s Dream-themed garden rooms – it’s got every setting you could ever imagine watching a film in. Plus, the rooms here are all private, so you won’t have to worry about kids kicking your seat. 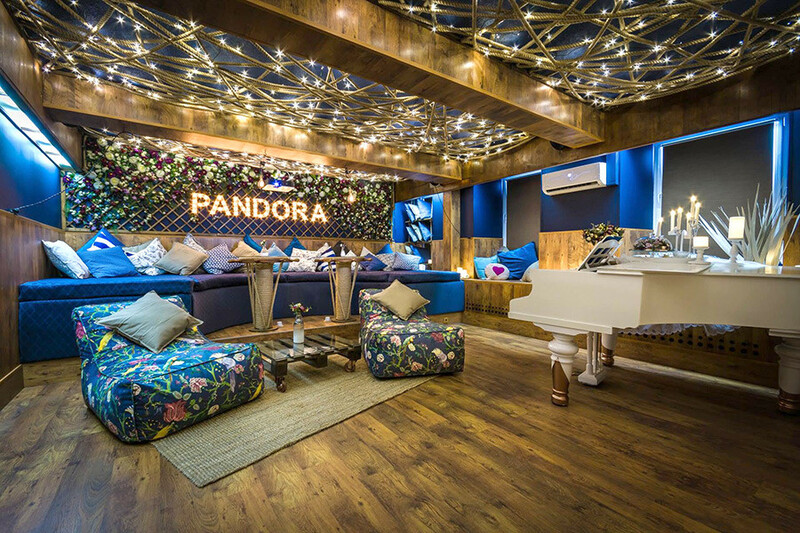 Although some of the theaters accommodate larger groups, the principle behind Pandora is that it’s as romantic as possible, and therefore geared more towards couples. It’s also you who chooses the film, so if you want to watch something in a language other than Russian, you can ask them in advance to prepare it for you. Let’s be honest, you probably couldn’t think of a better idea for a date spot if you tried. Prices for a two-hour screening start from 990 rubles ($15.95), not including the costs of any food or drinks you order there. This tall, narrow, ground-floor section of an old Stalin-era government building has no right to be a cinema – yet with stylish tables and plush chairs, the owners have turned this hall into a cinema-café. In this unique, arc-ceilinged establishment, spectators munch on cakes and coffee while watching films down the other end of the elongated passageway, giving it a relaxed, social atmosphere that redefines the way you view films. Zvezda is perhaps the best of all places on this list to watch new releases, both mainstream and arthouse. What’s more, most of these films are screened in their original languages. Depending on the screening time, you can also snap up a ticket for as little as 100 rubles ($1.60). Just get there early – with the length of the hall in mind, being seated at the back might make the screen a distant prospect, quite literally.